The process of granting new free television licenses is going on. 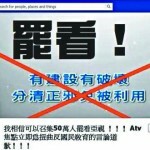 The cureent free TV licensee ATV “forced" its staff and artists to participate an assembly to “say NO" to this policy. [影像] 港蘋果過百員工集會「援台蘋」｜[Video] HK Apple Daily supports Taiwan’s “colleague"